Just barely keeping to my 1000 words a writing day goal. It’s good. Onward to finish most of chapter 2 tomorrow, I hope. I am basically opposed to puzzle narratives/metaphor when it comes to disability. I think it suggests that things are broken or disordered, and that it’s possible to snap everything into shape and make it nice and neurotypical. On the other hand, the new research into Schizophrenia is pretty interesting. Summary here. Original here behind paywall. More interesting to me was October’s findings on the efficacy of early intervention, rather than waiting for crisis, when it comes to Schizophrenia. From HuffPost Highline. I lost a week teaching, doing my administrative job, and then writing some other pieces. I will have to figure out better book focus as I go forward. But I’m back writing now. UPDATE: The Arc of Texas has changed their job requirements to remove “physical and mental requirements” entirely from the list. UPDATE 1/29/16 – Please see Kyle Piccola’s comment from The Arc of Texas in the comment thread. Archived at the bottom of the thread for record-keeping purposes. 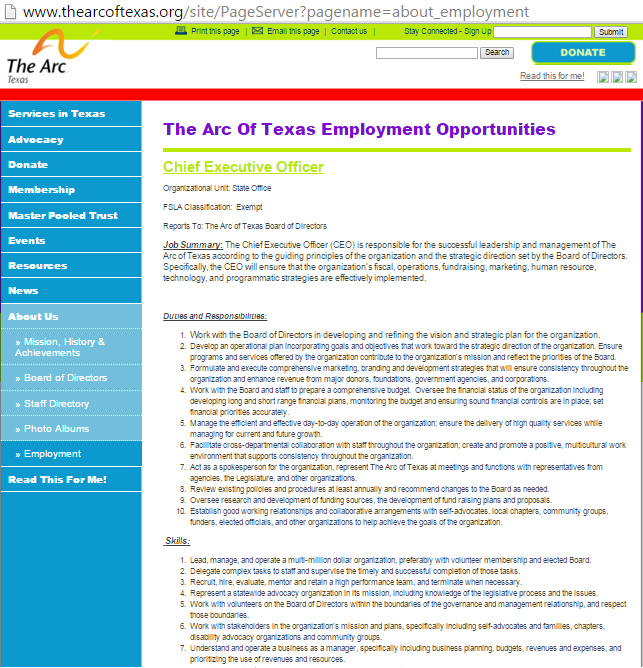 As of January 15, The Arc of Texas was hiring a CEO and State Advocacy Coordinator. You can see their job ads here. I have put screenshots at the bottom as of 1/27/16 in case they change them. Update: I cut/pasted the full text of the ads for better accessibility as well. Each job has a list of physical and mental requirements. I have put in a call to The Arc for comment and will be writing more when I get it. Job Summary: The Chief Executive Officer (CEO) is responsible for the successful leadership and management of The Arc of Texas according to the guiding principles of the organization and the strategic direction set by the Board of Directors. Specifically, the CEO will ensure that the organization’s fiscal, operations, fundraising, marketing, human resource, technology, and programmatic strategies are effectively implemented. Work with the Board of Directors in developing and refining the vision and strategic plan for the organization. Develop an operational plan incorporating goals and objectives that work toward the strategic direction of the organization. Ensure programs and services offered by the organization contribute to the organization’s mission and reflect the priorities of the Board. Formulate and execute comprehensive marketing, branding and development strategies that will ensure consistency throughout the organization and enhance revenue from major donors, foundations, government agencies, and corporations. Work with the Board and staff to prepare a comprehensive budget. Oversee the financial status of the organization including developing long and short range financial plans, monitoring the budget and ensuring sound financial controls are in place; set financial priorities accurately. Manage the efficient and effective day-to-day operation of the organization; ensure the delivery of high quality services while managing for current and future growth. Facilitate cross-departmental collaboration with staff throughout the organization; create and promote a positive, multicultural work environment that supports consistency throughout the organization. Act as a spokesperson for the organization, represent The Arc of Texas at meetings and functions with representatives from agencies, the Legislature, and other organizations. Review existing policies and procedures at least annually and recommend changes to the Board as needed. Oversee research and development of funding sources, the development of fund raising plans and proposals. Establish good working relationships and collaborative arrangements with self-advocates, local chapters, community groups, funders, elected officials, and other organizations to help achieve the goals of the organization. 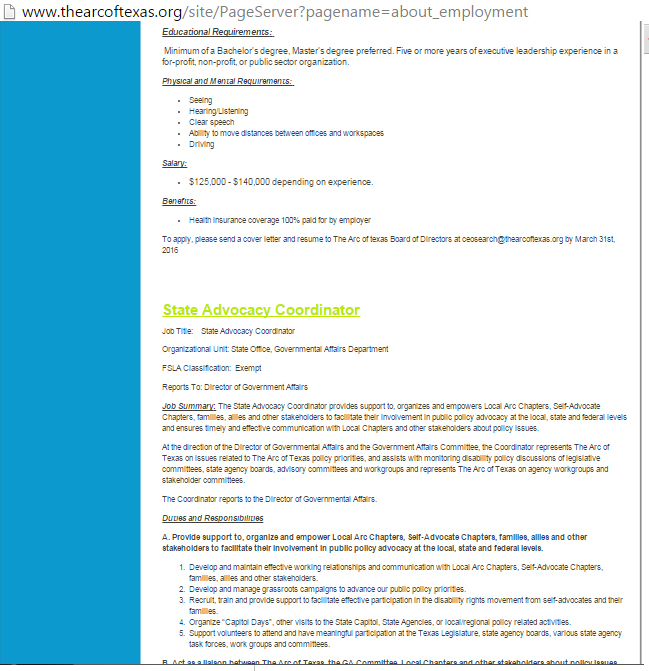 Lead, manage, and operate a multi-million dollar organization, preferably with volunteer membership and elected Board. Delegate complex tasks to staff and supervise the timely and successful completion of those tasks. Recruit, hire, evaluate, mentor and retain a high performance team, and terminate when necessary. Represent a statewide advocacy organization in its mission, including knowledge of the legislative process and the issues. Work with volunteers on the Board of Directors within the boundaries of the governance and management relationship, and respect those boundaries. Work with stakeholders in the organization’s mission and plans, specifically including self-advocates and families, chapters, disability advocacy organizations and community groups. Understand and operate a business as a manager, specifically including business planning, budgets, revenues and expenses, and prioritizing the use of revenues and resources. Reflect nonprofit law and rules, including IRS rules for nonprofits. Reflect business and charitable donation development, including fundraising methods and sources, and accountability to grant makers and donors under contracts or conditions in grants and donations. Minimum of a Bachelor’s degree, Master’s degree preferred. Five or more years of executive leadership experience in a for-profit, non-profit, or public sector organization. $125,000 – $140,000 depending on experience. 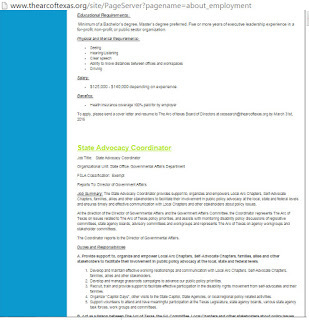 Job Summary: The State Advocacy Coordinator provides support to, organizes and empowers Local Arc Chapters, Self-Advocate Chapters, families, allies and other stakeholders to facilitate their involvement in public policy advocacy at the local, state and federal levels and ensures timely and effective communication with Local Chapters and other stakeholders about policy issues. At the direction of the Director of Governmental Affairs and the Government Affairs Committee, the Coordinator represents The Arc of Texas on issues related to The Arc of Texas policy priorities, and assists with monitoring disability policy discussions of legislative committees, state agency boards, advisory committees and workgroups and represents The Arc of Texas on agency workgroups and stakeholder committees. The Coordinator reports to the Director of Governmental Affairs. A. Provide support to, organize and empower Local Arc Chapters, Self-Advocate Chapters, families, allies and other stakeholders to facilitate their involvement in public policy advocacy at the local, state and federal levels. Develop and maintain effective working relationships and communication with Local Arc Chapters, Self-Advocate Chapters, families, allies and other stakeholders. Develop and manage grassroots campaigns to advance our public policy priorities. Recruit, train and provide support to facilitate effective participation in the disability rights movement from self-advocates and their families. Organize “Capitol Days”, other visits to the State Capitol, State Agencies, or local/regional policy related activities. Support volunteers to attend and have meaningful participation at the Texas Legislature, state agency boards, various state agency task forces, work groups and committees. B. Act as a liaison between The Arc of Texas, the GA Committee, Local Chapters and other stakeholders about policy issues. Conduct in-person trainings/meeting, webinars, phone calls, social media and targeted email marketing to advocates across Texas. Facilitate communication between grassroots stakeholders, The Arc of Texas staff, GA Committee members and The Arc of Texas Board in a timely manner. Utilize the latest available developments in technology to communicate The Arc of Texas message to internal and external stakeholders (for example, “action alerts” and other campaigns). Networks with allied organizations and coalitions to promote collaborative relationships on issues related to The Arc’s policy priorities. When necessary, provide testimony in support of the positions of The Arc of Texas at hearings and meetings. Minimum of bachelor’s degree in Political Science, Nonprofit management, Education, Human Services or a related field from a recognized college or university and at least three years of progressively responsible positions in disability advocacy. Ability to work independently and interactively, to handle multiple priorities and to be productive under stress. Experience implementing direct action organizing campaigns. Knowledge of programs, services, rights and benefits available to persons with disabilities. Ability to effectively communicate with parents and advocates on behalf of their sons, daughters and others with intellectual developmental disabilities. Ability to effectively communicate with self-advocates with intellectual disabilities to have a voice in the policies and laws that are made on their behalf. Knowledge of legislative and administrative processes impacting the development of public policy. Networking, organizing and coalition-building skills. Passionate about The Arc of Texas mission and the individuals we serve. UPDATE 1/29/16 – Please see Kyle Piccola’s comment in the comment thread. Archived here for record-keeping purposes. 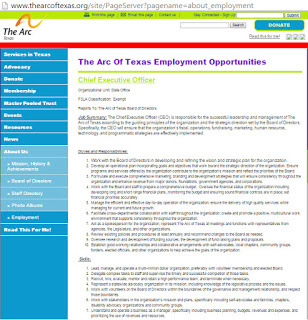 The Arc of Texas would like to offer an open and sincere thank you to you and to others who brought to our attention a job posting that was not inclusive to people with disabilities. As much as it hurts to be wrong, we know because of this experience that we will come out a stronger organization. As advocates, we tirelessly work to right the wrongs in our world and hope to make our communities a better place. By default, it’s in our nature to land on the right side of history. That is why it was devastating to get called out for not being inclusive and promoting practices that excluded others. We have looked into how this happened, and have learned that the job requirements that were wrongfully included in our postings were left over from when we employed drivers for our household recycling program. The CEO job description that was recently approved by our Board of Directors did not include the exclusionary language as shown in the job posting. Thankfully, being perfect isn’t a requirement to be an advocate, but owning your missteps and using them to promote progress is. That is why we have fixed the mistake and are working internally and with coalition partners to ensure it will never happen again. It is our responsibility to hold each other to high standards and encourage nothing less than the best of everyone. The Arc of Texas’ mission is to promote, protect and advocate for the human rights and self-determination of Texans with intellectual and developmental disabilities and we are committed to being the best we can be. We look forward to working alongside other advocates in the disability community to address the barriers to independence, community participation and employment for people with intellectual and developmental disabilities in Texas. It’s my understanding that the head of NARAL – Missouri will read this Testimony at a Senate Hearing for SB 802, a bill that make it illegal to have an abortion after a pre-natal diagnosis. 1) The best way to prevent abortions after a prenatal diagnosis is to make the words “Down syndrome” less scary. These bills will make it harder, even criminal, to talk about Down syndrome and abortion. From last night’s Town Hall. SANDERS: I get calls – I have gotten calls in my office, and I’m sure other senators have as well. This is the call. Somebody calls us up and said, I’m very worried about my brother. I’m worried what he might do to himself or, to answer your question, to somebody else. He may be homicidal. He may be suicidal. We have searched desperately to find health care – mental health treatment for him. We cannot find mental health treatment which is affordable, which is accessible. This is a pretty good answer, as politicians go. He didn’t blame mental health for gun violence. He did talk about accessibility. The better answer is – we need to make sure care is accessible for people long BEFORE they go into crisis. That’s not happening currently (see my pieces here and here). Michael Marshall is the latest victim of the Cult Of Compliance. Last November Marshall, who had schizophrenia, was placed into prone restraint and died, choking on his own vomit. This piece discusses the technique and links it to the death of Ethan Saylor and Eric Garner. Notice how the DA places blame for Marshall’s death on his disability. Intersections: Race, class, disability, the carceral state. The criminalization of homelessness. So much more. It’s everything I write about in one horrific, fatal, episode. And no one is being held accountable. Here’s the video. Obvious trigger warnings apply. Born This Way was the new Down syndrome reality show that aired over December and January. I wrote a review of it here as basically fine TV limited by its artificial format. Here, though, is a really detailed essay on the show including, wonderfully, interviews with self-advocates about watching it. Opinions, of course, vary widely, no one is really upset by the show (nor should be), but not everyone is deeply moved or think it’s transformative. Here’s my favorite interview. For this article, Ms. Gehringer asked her son directly about the show and forwarded me the questions and answers. Hey, Agent Carter is back. Last year, a lot of people criticized the show for its relentlessly white cast (other than a jazz club owner), when New York in the 40s was a diverse city. I think the producers heard, as episode 1 engages directly with racism and segregation and had a handsome black male lead who (spoiler!) Peggy kisses. alone celebrating real disability. Last year, Eddie Redmayne was awarded Best Actor for playing Stephen Hawking, a disabled person, even though he’s fully able bodied. Playing crip is a great way to get attention, but is not the same as diversity. – it’s gender, age, disability, sexual orientation, social background, and – most important of all, as far as I’m concerned – diversity of thought. 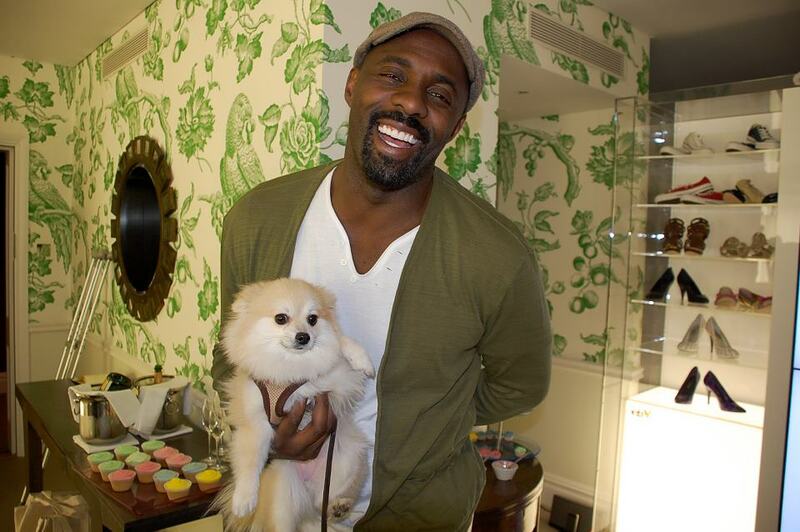 Please send that message to the Academy, should they should ever bother to nominate you (also stop wasting your time as Heimdall, but that’s a separate conversation). Update note: I’m not saying ALL conversations about diversity need to include ALL aspects of diversity. There are lots of moments to discuss just race, or just sexuality, or just ethnicity, or just disability, or anything! But if you are going to release a big aspirational list and you leave out disability, it’s very telling.